Revenue Streams are the various sources from which a business earns money from the sale of goodsSales RevenueSales revenue is the starting point of the income statement. Sales or revenue is the money earned from the company providing its goods or services, income or provision of services. The types of revenue that a business records on its accounts depend on the types of activities carried out by the business. Generally speaking, the revenue accounts of retail businesses are more diverse, as compared to businesses that provide services. To classify revenues at a high level, there are operating revenues and non-operating revenues. Operating revenues describe the amount earned from the company’s core business operations. Sales of goods or services would be an example of operating revenues. Non-operating revenues refer to the money earned from a business’ side activities. Examples include interest revenueCapital Gains YieldCapital gains yield (CGY) is the price appreciation on an investment or a security expressed as a percentage. Because the calculation of Capital Gain Yield involves the market price of a security over time, it can be used to analyze the fluctuation in the market price of a security. See calculation and example and dividend Dividend vs Share Buyback/RepurchaseShareholders invest in publicly traded companies for capital appreciation and income. There are two main ways in which a company returns profits to its shareholders – Cash Dividends and Share Buybacks. The reasons behind the strategic decision on dividend vs share buyback differ from company to companyrevenue. Revenue from goods sales or service fees: This is the core operating revenue account for most businesses, and it is usually given a specific name, such as sales revenue or service revenue. Interest revenue: This account records the interest earned on investments such as debt owned. This is usually a non-operating revenue. Rent revenue: This account records the amount earned from renting out buildings or equipment, and is considered non-operating revenue. Dividend revenue: The amount of dividends earned from holding stocks of other companies. This is also non-operating revenue. As a financial analystGuide to Becoming a Financial AnalystHow to become a financial analyst. Follow CFI's guide on becoming a financial analyst - networking, resume, interviews, financial modeling skills and more. We've seen thousands of people become financial analysts over the years and know precisely what it takes., analyzing a company’s performance in terms of revenue is always one of the crucial tasks. Therefore, an analyst must be able to recognize the different revenue streams from which the company generates cash and interpret the revenue figures on financial statements. When a financial analyst looks at financial statements, the revenue number reflects the amount recognized by the company when goods are sold or services rendered, regardless of whether cash is received at that time. Out of the four revenue streams discussed, recurring revenue is the most predictable income to a business because it is expected that the cash inflowThe Ultimate Cash Flow Guide (EBITDA, CF, FCF, FCFE, FCFF)This is the ultimate Cash Flow Guide to understand the differences between EBITDA, Cash Flow from Operations (CF), Free Cash Flow (FCF), Unlevered Free Cash Flow or Free Cash Flow to Firm (FCFF). Learn the formula to calculate each and derive them from an income statement, balance sheet or statement of cash flows remains consistent with a stable customer base. In contrast, transaction-based and service revenues tend to fluctuate with customer demand and are more difficult to foresee. Seasonality is also often a major factor contributing to the variability in sales of goods and service. Project revenue is the most volatile and risky revenue stream out of the four because it is largely contingent on customer relationships. 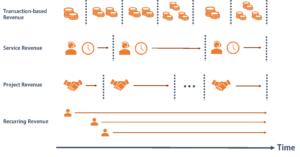 Therefore, businesses would need to invest a considerable amount of time in managing their relationships to maintain this revenue source. 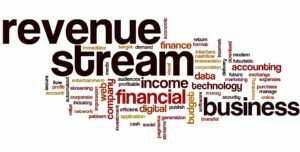 Understanding the revenue stream allows a financial analyst to realize the pattern of cash inflows, and therefore be able to quickly observe unusual movement or changes in revenue trend, and identify the causes. This is when an analyst performs financial analysis and provides a meaningful explanation for variances. Depending on the type of revenue models a company employs, a financial analystGuide to Becoming a Financial AnalystHow to become a financial analyst. Follow CFI's guide on becoming a financial analyst - networking, resume, interviews, financial modeling skills and more. We've seen thousands of people become financial analysts over the years and know precisely what it takes. develops different forecasting models and carries out different procedures to obtain necessary information when performing financial forecasting. For companies with a recurring revenue stream, a forecast model should have a uniform structure and a similar pattern in revenue predictions. For a project-based revenue stream, it is essential for an analyst to keep track of the latest project opportunities and continuously modify the forecast model to produce an accurate forecast. The forecast model might look very different each month, due to the constant renewal of projects taking place and the inclusion of various risk factors.